This cushion cut authentic aquamarine gemstone ring looks even more sensational with the diamond halo surrounding the gemstone! Apples of Gold Jewelry surrounds a beautiful AA rated, ice blue square cushion cut aquamarine gemstone with thirty four smaller diamonds, which total 0.34 carats and are rated H-I for clarity and SI for color. The 8mm x 8mm aquamarine stone also pops due to the diamonds that are placed on the 14K yellow gold band. 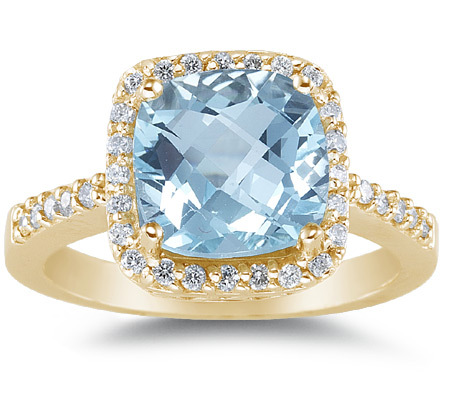 We guarantee our Large Cushion-Cut Aquamarine and Diamond Halo Cocktail Ring, 14K Yellow Gold to be high quality, authentic jewelry, as described above.